Now Available! 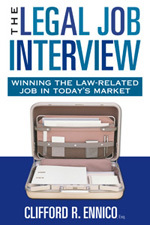 A Completely Revised and Updated Edition of the All-Time Classic "How To" Book on Interviewing for a Legal Job. It is a scary time to be a lawyer. There is more competition for jobs than there has ever been before, and lawyers just don't get the respect they once did. The traditional career path that has guided lawyers for generations has completely broken down, and lawyers are finding ever new ways to practice law and build successful practices. Yet, for all the same reasons, it has never been a more exciting time to be a lawyer. Increasingly, those who succeed in the profession are those who are willing to take charge of their careers, take an entrepreneurial approach to the practice of law, and find new ways to provide cost-effective legal services. You shouldn't have to go it alone. Our mission is to provide "real world" career advice for lawyers and others in the legal services industry. Through books, audio tapes, newsletters, seminars, one-on-one career counseling, and other information resources, our goal is to help lawyers manage their careers better, develop better "people skills", and improve their chances of finding success and satisfaction in America's toughest profession. Thinking about becoming a lawyer? Looking for your first legal job? Considering leaving the legal profession for greener pastures? If so, then legalcareer.com can help you find success and satisfaction in America's toughest, but most rewarding, profession. Want to learn the secrets of a successful legal job interview? Want to get on your law school's Law Review? Not Sure if a Legal Career is Right for You? Not Sure if Your Specialty is the Right One? Not Sure How to Find a Legal Job? Not Sure What Your Resume or Cover Letter Should Look Like? Thinking About Leaving the Law Behind? Wondering Why You're Not Happy as a Lawyer? Getting Ready for a Legal Job Interview? Thinking About an In-House Legal Job? Need a contract or legal form for your business law practice? Click the link for the most complete, comprehensive collection of business agreements and legal forms anywhere. What do YOU want to do on legalcareer.com? Have your resume critiqued by an expert? Go through a mock telephone interview? Find out more about our publications? Have a legal career expert speak to your school or organization? Attend a legal career seminar?